I am having one of those sense memory experiences. They seem to happen for me a great deal in summer. It must be the warm air tickling my skin and nose hairs, and rustling up odors and sounds that hearken back to “Dayes of Olde”, as I have taken to calling my life before kids. That last one hit me full-force the other day. We have a small, but hopeful raspberry bush, not nearly as lush and fruit-heavy as the one I remember from my childhood in our backyard. It was enough to do the trick however, and after breathing in the scent for five minutes without moving a muscle, I knew I had to get up and get a flat of them. 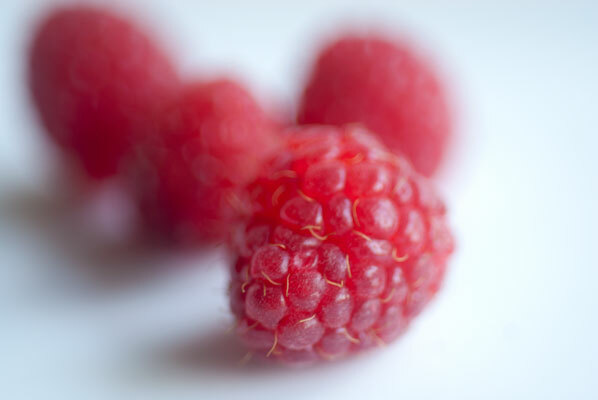 Fortunately, this was a very easy matter, one I had been meaning to get around to for days, and perhaps our own helpful berries were just doing their best to remind me, but it got me quickly on my way to a local treasure – Bob’s Fruit Stand. Arriving home laden with bounty, I set about to re-create another flavour of summers remembered – this one from the sweet summer I fell in love. My darling and I spent many wonderful evenings walking around the English Bay seawall, and often wound up at a small chocolate shop which made (at that time) a highly sophisticated version of an ice cream bar. Called the Kitsilano Bar (after a trendy section of Vancouver), it was composed of a rectangle of freshly churned in-house ice cream, dipped upon ordering in dark, milk or hazelnut milk chocolate couverture. I cannot remember the name of the shop, and they had a very limited choice of ice cream flavours: raspberry, strawberry, chocolate or vanilla. It mattered not, because the taste and texture was exquisite. At least, I remember it being exquisite. Pretty much everything was that summer. I recall the couverture clung to the ice cream in a thin, perfectly smooth glossy sheet. 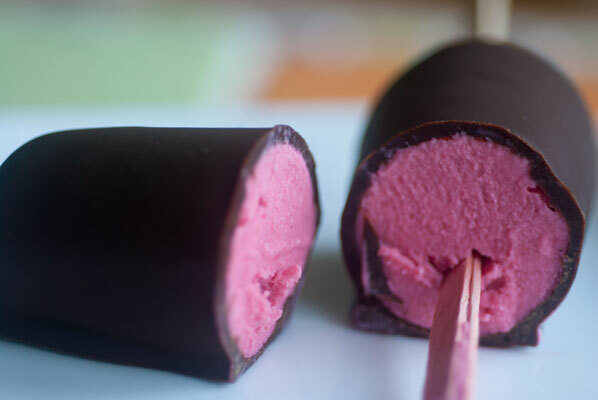 My task this afternoon is to re-create my favorite: a dark chocolate coated fresh raspberry ice cream bar. I stumbled upon one in the back of his must-have-for-anyone-who-wants-to-make-ice-cream marvelous book, The Perfect Scoop. It was for tartufi, an Italian delicacy taking its name from the truffle, and in very basic terms, a chocolate covered ball of ice cream (usually served as two flavours, or with fruit in the middle, in Italy). Tartufi is another “fancy” delight I remember trying for the first time that wonderful summer … and being woefully disappointed at the hard-as-a-rock, industrial tasting ice cream used in the one I sampled. It had looked so much more exciting than it tasted. But, of course, the tartufi in David’s book should not even be classified as the same species as the mass-market one I tried. These ones are made from scratch from the freshest ingredients possible. Making ice cream is easy and contemplative and oh so satisfying when you have a good home ice cream freezer. The one I have involves a frozen cylinder that I keep in a plastic bag, in my chest freezer, to have on hand at a moment’s notice. It goes into a housing, which is then plugged in, sits on a table top, is turned on, and away it goes. Thirty minutes later, I have 1 litre of glorious ice cream or frozen yogurt. The only drawback with this type is that the cylinder must be frozen solid, which means you are limited to one batch every 24 hours, so it is not ideal if you want to make several batches in a hurry. It’s kind of like an electric Donvier. I used to possess a nifty little Salton electric machine, with a fan, where the whole thing went into your freezer, the electrical cord hanging out through the top seal, and plugged in. It took about the same amount of time, and I liked the fact that it used the freezer’s chill, rather than a separate cylinder which has to be re-frozen. Soon, I have a bowl of bright pink hued ice cream, churned to a lovely consistency, soft enough to scoop into some plastic popsicle molds I have standing by. 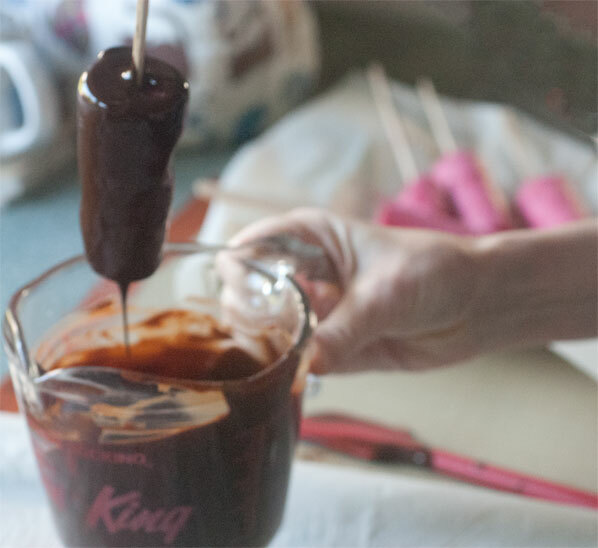 I leave off the plastic lid/sticks and instead, insert wooden skewers/popsicle sticks, so that I will be able to dip them fully into the chocolate, once they are unmolded. I pop them in the most level part of my freezer. When they are solid, I run hot water over the outside of the molds, hold my breath and – eureka! They slide out. 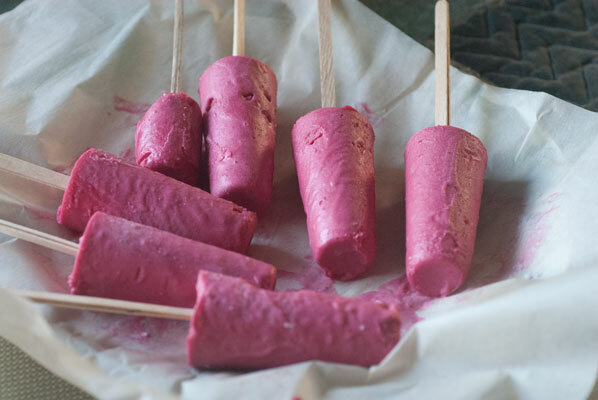 I immediately put the naked ice cream pops on a parchment lined baking pan, and pop them back into the freezer to harden. 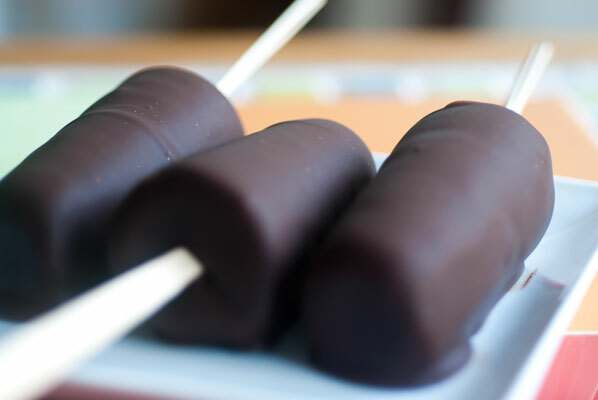 Keep the ice cream in the freezer until the absolute last moment prior to dipping. And here is a link to his excellent recipe and method for dipping. Actually, having the skewer to hold on to made the dipping far easier than if I had had to roll them (a bit like enrobing), and although I ended up with bars that definitely had one “good side” and one “not so perfect”, because I had to lay them down, they ended up being deliciously creamy on the inside and wonderfully crispy on the outside. A little bite of nostalgia. 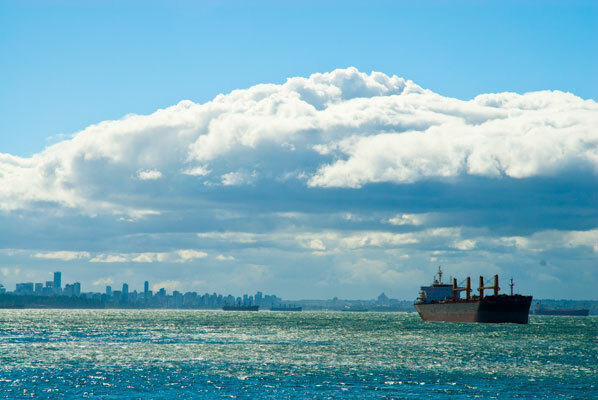 As it turns out, it is the perfect night to celebrate with these bars, as it is the first night of the Celebration of Light – the world’s largest off-shore international fireworks competition – held annually in English Bay. Hmmm, this could be a night to rekindle the romance of that summer of “Dayes of Yore”.